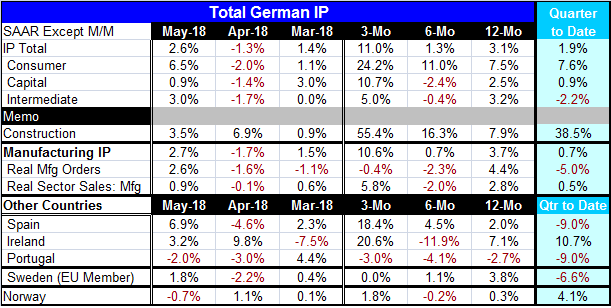 German IP Shakes Off Decline with Solid May...But What's Next? German industrial production (IP) is up by a strong 2.6% in May after a 1.3% decline in April. Germany is breaking out of a period in which output gains have lagged. But we will have to watch closely to see if these gains endure. The output of consumer goods is up by a strong 6.5% in May and up at a 24% annual rate over three months. Capital goods gained 0.9% in May after a 1.4% drop in April and show a strong 10% annual rate gain over three months, shaking off its 2.4% annual rate decline over six months. Intermediate goods also indicate a reversal with output, up by 3% in May following a 1.7% decrease in April and showing a solid 5% expansion pace over three months, reversing a 0.4% decline over six months. The German construction sector is up very consistently and quite strongly with an annualized gain of 55.4% over three months. However, German consumption has not been strong enough to support this kind of gain in the output of consumer goods. And real manufacturing orders are declining on balance over both three-months and six-months. And real orders do tend to lead real output in Germany. While this rebound is impressive, the German manufacturing PMIs do not show this kind of strength. And as we see here, other underpinnings also are lacking. Real sector sales in manufacturing have been a bit more consistent, but that is not a leading gauge. In the quarter-to-date, German IP is up at a 1.9% pace on gains in each sector except for intermediate goods. Real manufacturing orders are falling at a 5% annual rate in the quarter-to-date. Spain, Ireland, and Sweden showed IP increases in May while Portugal and Norway showed declines. Over three months, Spain and Ireland have strong double-digit gains; Norway has a modest 1.8% pace of increase; Sweden shows flat output; and Portugal shows an output decline at a 3% pace. In the quarter-to-date, Europe shows more irregularity with Spain, Portugal and Sweden all showing significant declines while Ireland and Norway show solid gains on that horizon. Economic signals continue to swirl to some extent. And with U.S.-China tariffs in play, the global risks are clearly higher. The U.S. and Europe are minding their own dispute with no clear signal how much impact these tariffs will produce on real growth. Stocks have been declining or waffling while the yield curve in the U.S. continues to flatten to give us something else to think about as the Fed tries to distract us from looking at that gauge. The risks are there. This kind of output acceleration in Germany is almost certainly ‘make up’ for past lagging behavior. The German fiscal posture is still contractive. Output in Germany is not going to run away. It is hard to see this sort of pick-up staying in force.